The teachers have created age-appropriate activities to help your child meet his/her milestones throughout the day. Here are few of the milestones and activities that are done during the day. 1. Tummy Time - this activity will help strengthen your child’s neck, shoulders and core muscles. 2. Story Time - reading to babies will stimulate their brain cells for positive brain growth. 1. Motor Development - reaching for objects to grasp with hands. 2. Language - teaching them sign language to express their needs. Each child has an individual written plan; the plan describes the daily routine. You will give a detail description of your child’s napping and feeding pattern. As they grow the written plan will need to be updated during the school year. The Daily Report is a form you will fill out every day when you drop off your child. This form allows you to inform the teacher how your child slept the night before, the last bottle given before coming to school, what mood the child is in when arriving to school and any other information you want the teacher to know about. The teacher section of the form will tell you about how their day went; diaper changes, feeding time, napping, activity and overall how their day went. If your child needs diaper cream a medication form must be filled out. Most of all communication with your child’s teacher is key to make sure your child’s daily needs are met. 1. 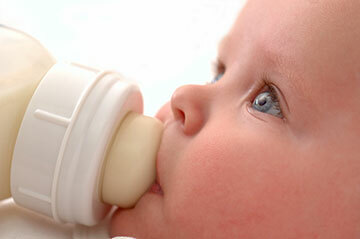 All bottles must be labeled with the child’s first and last name, current date, and how many ounces are in the bottle. The bottle must state if it is breast milk or formula. 2. Solid foods must come in labeled container with the child’s name and current date. 3. Sippy cups and pacifier must have the child’s name on it. 4. Diaper bag should include extra sets of clothes, diapers and wipes. 5. At the end of the day all empty bottles and food containers are sent home. For the protection of all the children your child will be sent home if the following symptoms occurs; Temperature of 101 degrees Fahrenheit or higher when in conjunction with any signs of illness. Diarrhea (more than one abnormally loose stool) Any other unusual sign or symptoms of illness. Countryside Christian Preschool has two infant classes. Each infant has their own individual schedule for the day, and we are aware of their daily needs and routines. Feeding, diaper changing and napping will all take place throughout the day. Tummy time includes fun activities such as music & movement, finger play, cause & effect toys, stacking toys, sensory toys, story time, balls and many more learning experiences. Each activity will be about 10 to 15 minutes long. Developmental/milestone assessments will be completed on each child; each child’s developmental needs will be met through this assessment tool. The Beyond Cribs & Rattles curriculum sets focuses on creating intentional, developmentally appropriate experiences for infants and toddlers. Beyond Cribs & Rattles emphasizes the development of the individual child through an understanding of the stages of sensorimotor, construction, and dramatic play seen in the play of infants and toddlers, by the use of their environment, which includes the use of play materials as well as the organization of play spaces. Kaplan Early Learning Company proudly presents Learn Every Day™: The Program for Infants, Toddlers, and Twos, this program is packed with Activities are domain specific tips, advice, strategies, and hundreds of activities to help you provide nurturing environments for infants, toddlers, and twos. I Love You Rituals offers rhymes and games that send the message of unconditional love and enhance children's social, emotional, and school success. These positive nursery rhymes, interactive finger plays, soothing games, and physically active can be played with children from infancy through age eight.